Who says time only moves one way? The Another Year Younger Rosette Ribbon begs to differ. 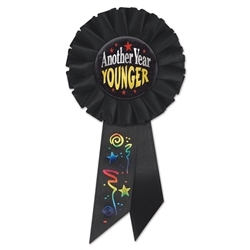 The Another Year Younger Rosette Ribbon is a great gag gift for someone who maybe getting up there in years. The ribbon is black with star and star spiral graphics. Add the forefront is the words "Another Year Younger" in gold and silver in front of a metallic red star. Looking to throw an over the hill party, check this items out like the vulture hat and Over the Hill Balloons.